The man identified by authorities today as the murderer of two police officers and another person in Sunday’s mass shooting in Las Vegas had long ranted against the “fascist” government, but the last comment he posted before the attack was the most chilling. Late Sunday, law enforcement officials say, Miller and his wife, Amanda Miller, embarked on a shooting spree that included the ambush-murder of two Las Vegas police officers as they ate at a restaurant and the killing of a male shopper at a nearby Walmart. Witnesses said that they shouted “this is a revolution” and draped the officers with a Gadsden flag — a symbol of liberty used by both the antigovernment “Patriot” movement and many Tea Parties — before going on to kill themselves as police closed in. On May 25, 2014, Miller also said on his page that he had been present at the mid-April standoff, some 60 miles outside Las Vegas, between rancher Cliven Bundy and federal agents trying to seize his cattle for nonpayment of grazing fees. Bundy, who was backed by hundreds of armed militiamen, ultimately won that battle, as law enforcement officers decided to stand down rather than risk a bloodbath after Bundy’s supporters pointed their weapons at a crowd of federal agents. On April 9, shortly before traveling to the Bundy ranch, Jerad Miller wrote that the standoff was “the next Waco,” a reference to a deadly 1993 standoff in Texas. 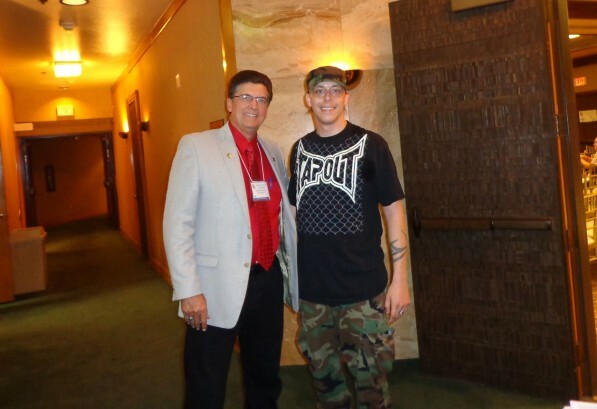 Miller also posted a photo of himself with Richard Mack, a former Arizona sheriff and leader of the Constitutional Sheriffs and Peace Officers Association, a radical Patriot group whose members were also at the Bundy standoff. The two met at a Feb. 8 campaign debate for libertarian candidates held in Clark County, Nev., where Bundy’s ranch is located. The Bundy standoff and the ultimate bowing out of the federal government, at least for the time being, is seen as a huge victory by the Patriot movement. No Patriot group in recent memory has stood face-to-face with a large crowd of armed law enforcement officials and forced the officers to back down. It seems likely that that victory has given new impetus to murderous radicals like the Millers. Miller’s Facebook page made several references to recent tangles with the law, apparently over a marijuana conviction. He spoke of talking to a “fascist” judge about the unfairness of the drug laws, and also of being sent back to jail, apparently after a failed drug screen, for seven weeks beginning in July 2013. But the bulk of his page made it clear that he saw himself very much as part of the Patriot, or militia, movement. 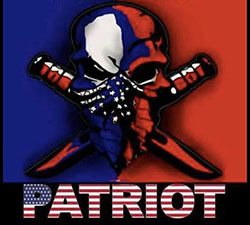 His profile picture shows two knives and the word “PATRIOT,” using a stars and stripes motif. He wrote a great deal about the Second Amendment, calling it a “Freedom Thing.” He criticized domestic spying. 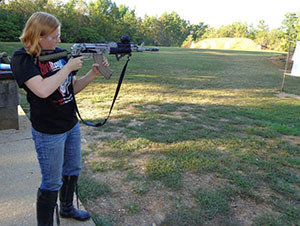 He cited Patriot gun rights activist Adam Kokesh. He “liked” Three Percenter Nation, a Patriot group headed by a former Alabama militiaman;Operation “American Spring,” a failed recent Patriot attempt to mount a huge protest in Washington, D.C.; and the Alliance Defending Freedom, a radical anti-LGBT Christian organization. He also cited a series of smaller gun rights groups approvingly. The killing in Las Vegas came just five days after U.S. Attorney General Eric Holder announced that he was reviving a special unit devoted to monitoring domestic terrorism that fell dormant in the aftermath of the 2001 Al Qaeda attacks. Holder pointed out, presciently, that in addition to Islamist terror the nation also faced the threat of "individuals within our own borders who may be motivated by a variety of causes from anti-government animus to racial prejudice."